The left thinks this is a great point, but that raises a question. Why do they support Common Core which is designed to dumb down American Students. Common Core High School students are not prepared to seek STEM degrees at our best universities. We are being ill served by Common Core. A perfect example of education efficiency is Mount Saint Mary’s. They educate our children with a limited budget and get the job done without wasting money. Government cannot (for some reason) do anything with a limited budget. Government bleeds money in everything it touches. It is not a money issue; it is government operating education at a level of efficiency compararble to that of the DMV. Thanks for brining up this discussion Russ. I thought you were a fan of John Adams Academy in Roseville, where the students wear “red, white and blue” uniforms. I have a scoop in the works about them: They are planning to expand into western Nevada County. Exactly Jeff. John Adams Academy is another wonderful example of efficiency in education. The wonderful thing about JAA and other private or charter schools is that the funds get directly to the kids without the compulsory government administation (arguably unnecessary) wasting a portion. Frankly Mount Saint Mary’s and JAA get better results for that very reason. See, we can agree on things…you just have to have an open mind. 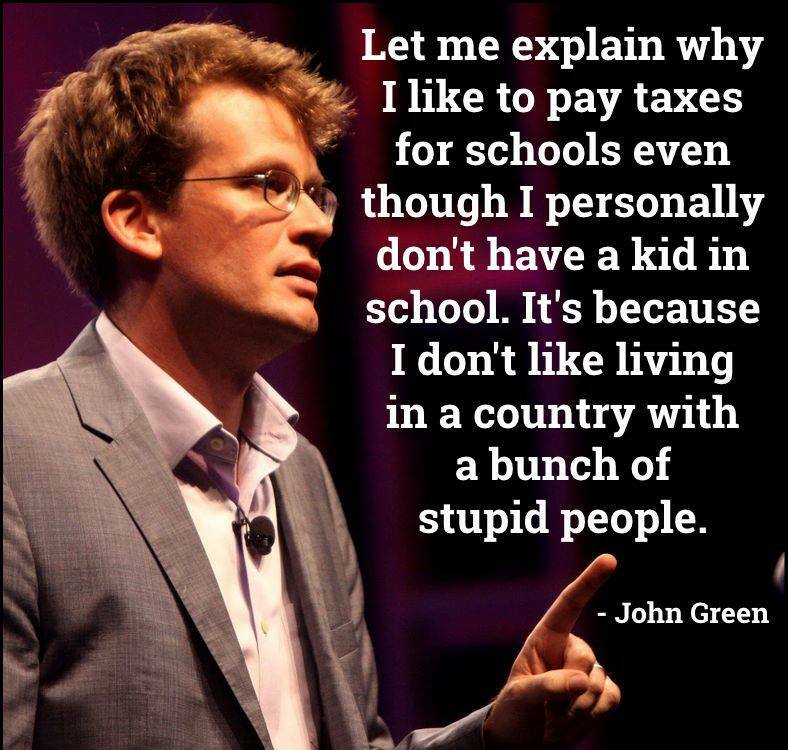 It doesn’t matter if Mr. Green likes paying taxes or not….he’ll pay them or there will be consequences. Eric Garners “crime” was denying the state its cut of his cigarette sales. Ultimately and through an unfortunate chain of events he paid with his life. So keep on telling yourself that it’s that you don’t want “a country full of stupid people” and that it isn’t that really down deep you know that some low level state functionary will be more than happy to choke you out on the street if you don’t pay up. I endorsed Pat Paulsen….had a yard sign and everything….wonder if my endorsement cost him all those elections? It is not tax payer dollars that is the issue, it is the misallocation of such dollars. Too many bureaucrats, not enough instruction. We even see this in Nevada County where the Superintendent of Schools is hell bent on building a new administration building as countywide enrollment decreases. It is just plain dumb. So is this silly picture. I endorsed Alteri-Sexton-Meek with a campaign sign in our yard. They won. You endorsed the losing candidate, Marianne Slade-Troutman. I hope you didn’t cost her the election. LOL. Russ, the left really does think this stupidly. In California they the state takes our property tax which we at the local level used to distribute mainly to our own schools and roads, and they send it back with rules. Now the feds do this to the states and most states don’t like it. Funny how crapola has flowed up then came back down. I actually saw this from a friend of mine whio is a liberal on a Facebook post. So you can remove the bigboy as a credit if you want. What would you write about if it wasn’t for my blog? ROFLOL.